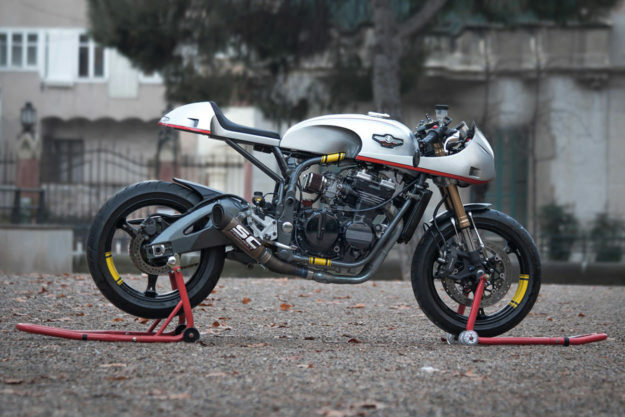 A spectacular Ducati designed to celebrate Alpinestars’ 55th anniversary, a Kawasaki GPX 600 R built by a lecturer in economics, an electric dragster from Alta, and a cafe racer … rocking horse from Germany. Kawasaki GPX 600 R by Jordi Soldevila The Golden Ratio is a mathematically driven design technique that, when applied properly, should render appealing, natural looking creations. It’s some pretty high-level stuff, which typically takes industry pros years of practice to get right. And I’d argue it’s even more complicated when the creation needs to be ridden. In Jordi Soldevila’s case, it took about 27 months. Yes, you read that correctly. This is financial consultant and economic lecturer Jordi’s first ever custom. He’s not a seasoned bike builder, but he is a passionate perfectionist with a long history with bikes. Not wanting to make things easy for himself, Jordi began with a plastic-fantastic Kawasaki GPX 600 R and promptly scrapped everything but the engine, frame and wiring loom. Everything else on this bike was hand built, shaped and welded by Jordi. He also rebuilt the engine, swapped both the front and rear suspension with those from a modern Gixxer, and machined the necessary bits to make it all fit together. Alpinestars 55th Anniversary Ducati 750 Sport As my wife reminds me, anniversaries are special events that deserve commemoration with equally special gifts. To ring in their 55th, Alpinestars tapped Michael ‘Woolie’ Woolaway to create a custom—one that would capture the history of the iconic brand, while also playing to its technological strengths. And in typical Woolie fashion, he knocked it outta the park. 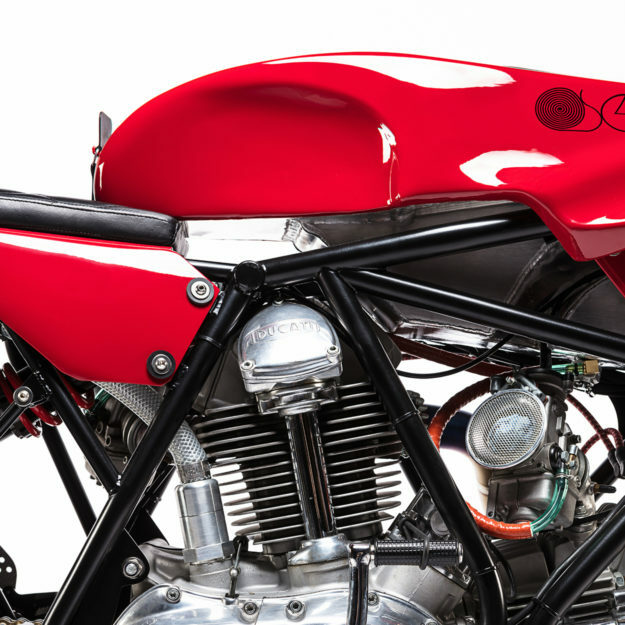 Starting with a race-built engine from a ‘74 Ducati 750 that was found still sitting in a crate, Woolie turned to Jeff Cole to help fuse up a modern frame. A gorgeous trellis design was settled on for strength, rigidity and lightness, and capped with minimal flowing bodywork. 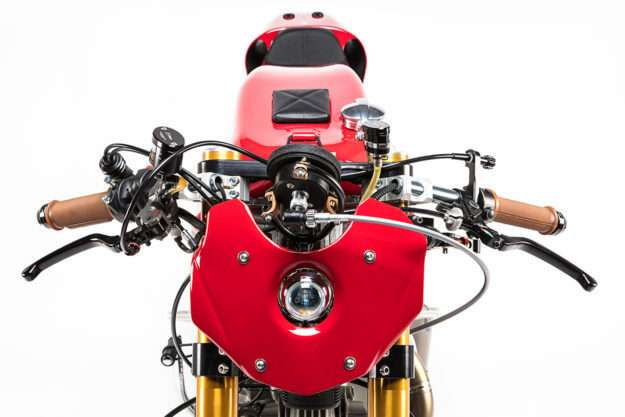 The tank, seat and tail are all bespoke units, expertly shaped by Woolie himself to deliver a vintage racer’s stance. There are some other old school nods thrown in for good measure, too. The rear brake is actuated by a thumb control, like the Brembo master on Mick Doohan’s Hondas in the mid 90s, and the seat was designed to echo Nicky Hayden’s from his days with the Italian marque. But other than that motor and its vibe, nothing on this bike is an antique. 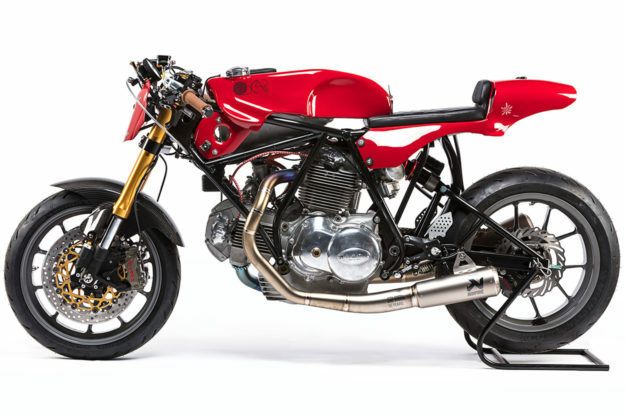 The suspension is an all-new set of goodies from Öhlins, the brakes are Brembo and the bike is riding on Marchesini wheels. 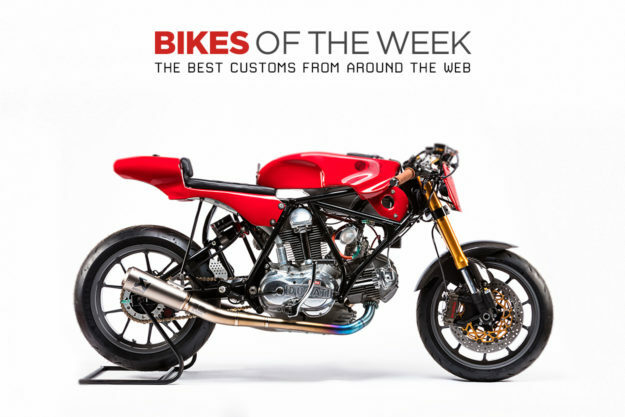 The exhaust is from Akrapovič and was built to a full MotoGP spec, and Michelin provided the slicks—which we imagine Alpinestars CEO Gabriele Mazzarolo will be roasting appropriately this weekend in Austin. 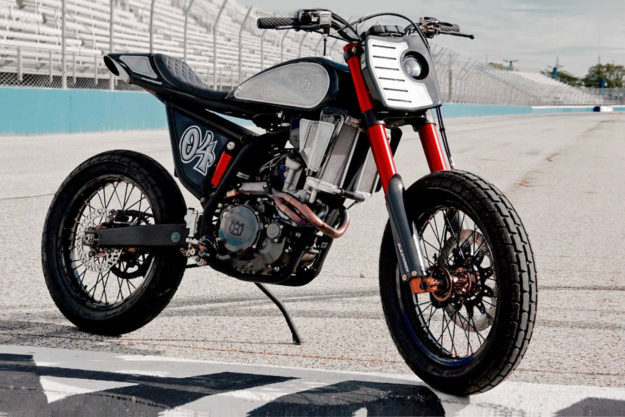 Alta Motors ‘Crapshoot’ If you were fortunate enough to make it to the Outlier’s Guild Motorcycle Show in L.A. a few weeks back—or the One Show in February—this stunning little drag bike probably popped up on your radar. 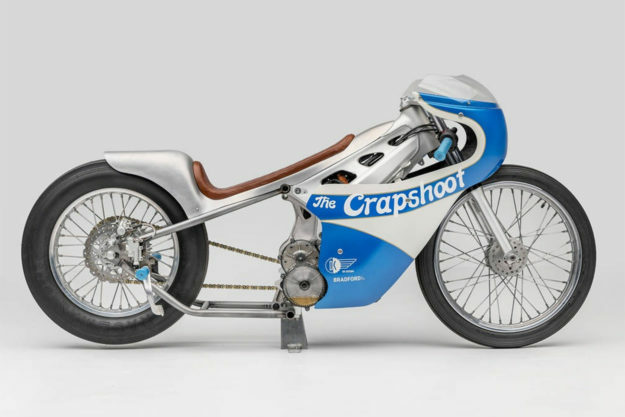 The Crapshoot is an all-electric collaboration between Alta Motors and local acquaintances that has us embracing our electron-fueled future like never before. 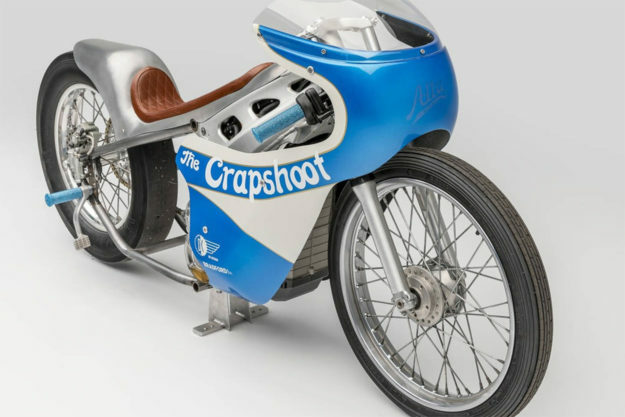 Paying homage to the quarter-milers of yore, Alta’s John McInnis wanted to show that, with some ingenuity and zero electrical-engineering degrees, an Alta Redshift could go from rad to bad. Of course, that didn’t mean that the builders behind this weren’t valedictorians in other areas of expertise. Working from a CAD drawing, Rusty Hub’s Vinnie Falzon fired up the welder to create the hardtail frame. The bodywork is a modified batch of glass from AirTech Streamlining that San Francisco’s DK Design transformed into the glistening, single piece unit that you see here. EBay find: Husqvarna 450SM tracker Have you got a tax refund quietly smoking away in your pocket? Looking to add a show bike to your fleet for a fairly reasonable investment? 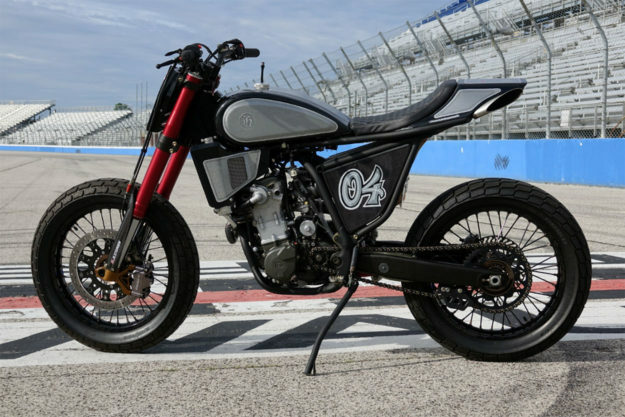 If you were at last year’s Mama Tried or Handbuilt show, you may have spotted this 2007 Husqvarna from Ryan Stephen of Freestylesupermoto.com. Well, it’s now for sale. Fully street legal and showing only 4,100 miles on the odometer, I’m feeling a little tempted by this one myself. 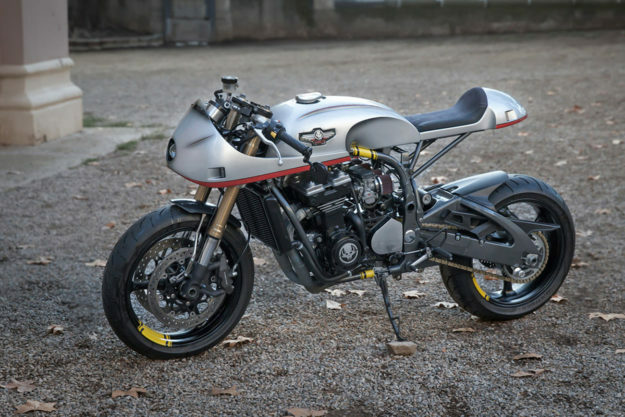 That’s because the 2007 Husqvarna 450SM that started on the bench was treated to a bevy of tasteful modifications. The stock subframe was replaced with an all-new aluminum unit to pick up the perch and deliver some custom character. The tail and tank are both hand built aluminum pieces and all paint and pinstripe work was hand done, too. 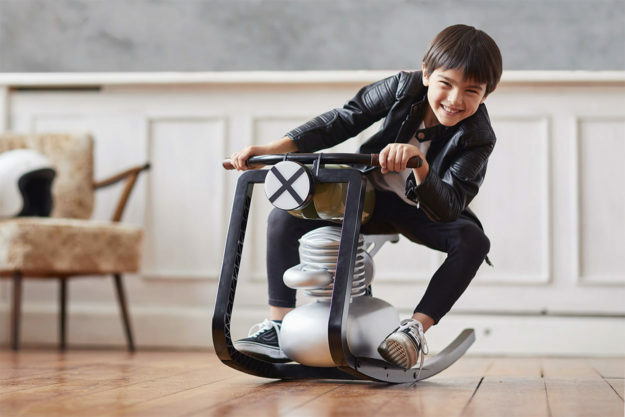 Moto Rocker by Felix Monza The North American motorcycle market has been ageing for some years now, and the manufacturers are all keen to introduce a new generation of riders to the culture, lifestyle and passion we love. 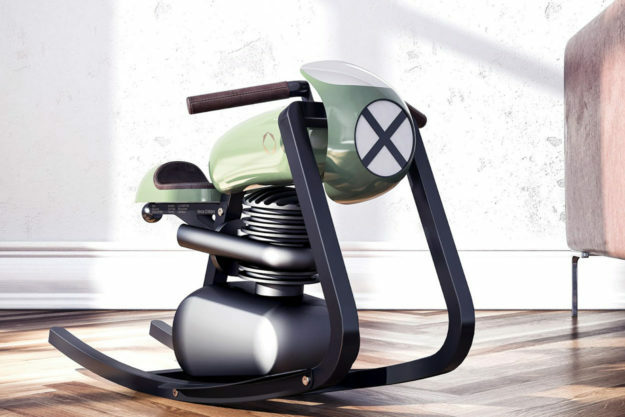 And while taking your kids out to races and bike nights could help, the German industrial designer Felix Monza figures we should just get ‘em hooked as early as possible—with his Moto Rocker.